Home Flickinger Tone Boxes – Angry Sparrow – Give Away! Flickinger Tone Boxes – Angry Sparrow – Give Away! Some pedals I hate giving away. This pedal is one of those pedals. 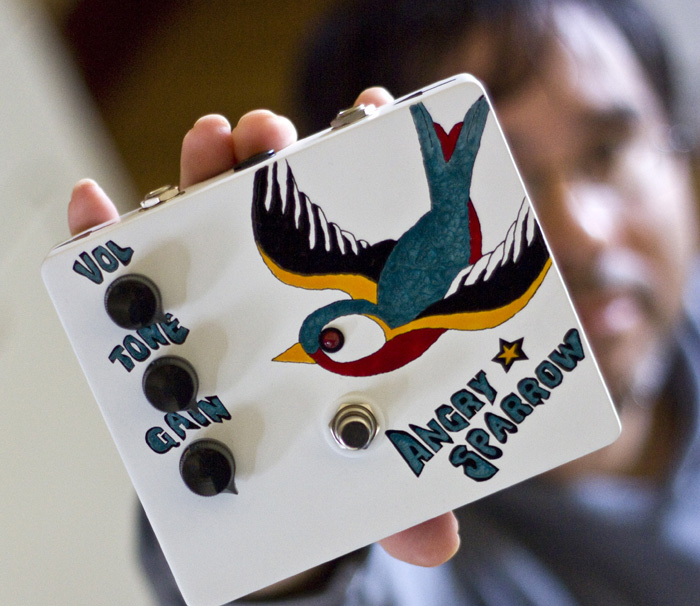 Today, I’m announcing the Flickinger Tone Boxes Angry Sparrow give away, and man, I wish didn’t have to go. It would fit nicely on my pedal board. This is a great sounding fuzz pedal falling in the vintage/classic fuzz tone, which is very versatile and very musical. Richard of Flickinger Tone Boxes was extremely generous to offer this pedal as a give away after we reviewed it. You can listen/read/view the full demo of this pedal here – “Flickinger Tone Boxes – Angry Sparrow Demo“. This will definitely be a great pedal (valued at $200) for a lucky EffectsBay.com reader. When you get a chance, please check out their site for other pedals. They’re definitely making some great pedals! I’m going to select one random entry on October 27th (Thursday) . I will email that random entry asking for the answer to the question listed below. They will have 24 hours to respond with the answer. If the 24 hours passes, I will select a new random entry and repeat the process until I receive confirmation from the winner. This is open to everyone. Yes, that means international! Also, one entry per person. Please read that last sentence again… “one” “entry” “per” “person”. And when I say ‘everyone’, I mean anyone older than 18 (sorry minors). The submission form will be open until October 27th (Thursday) 12PM MST. First, this is not a requirement, but you should ‘like’ EffectsBay on Facebook. It’s good way to keep in touch with new give aways and posts. Also, please consider joining the official EffectsBay.com mailing list. Traveled from Columbus Ohio to Knoxville TN to see a free outdoor concert by Warren Hayes. It one of the last of the Sundown in the City concerts.